Every day, thousands of people withdraw extra cash for daily expenses. Each transaction may be small, but the total amount of cash dispersed over hundreds or thousands of daily transactions can be very high. But every bank branch has a fixed cash flow, which must be set without knowing what each customer will need on a given day. This creates a challenge for financial entities. Customers expect their local bank office to have adequate cash on hand, so how can a bank confidently ensure each branch has enough funds to handle transactions without keeping too much in reserve? A quality project team led by Jean Carlos Zamora and Francisco Aguilar tackled that problem at Grupo Mutual, a financial entity in Costa Rica. When the project began, each of Grupo Mutual's 55 branches kept additional cash in a vault to avoid having insufficient funds. But without a clear understanding of daily needs, some branches often ran out of cash anyway, while others had significant unused reserves. When a branch ran short, it created high costs for the company and gave customers three undesirable options: receive the funds as an electronic transfer, wait 1–3 days for consignment, or travel to the main branch to withdraw their cash. Having the right amount of cash in each branch vault would reduce costs and maintain customer satisfaction. Using Minitab Statistical Software and Lean Six Sigma methods, the team set out to determine the optimal amount of currency to store at each branch to avoid both a negative cash flow and idle funds. The team followed the five-phase DMAIC (Define, Measure, Analyze, Improve, and Control) method. In the Define phase, they set the goal: creating an efficient process that transferred cash from idle vaults to branches that needed it most. 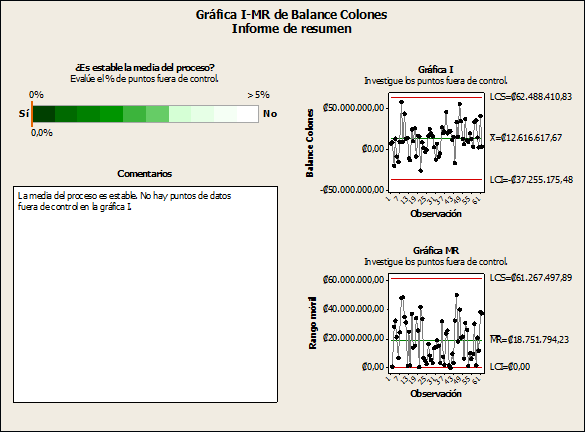 The Analyze phase began with an analysis of variance (ANOVA) for to explore how the banks’ cash flow varied per month. They used Minitab to identify which months were different from one another, and grouped similar months together to streamline the analysis. The team next used control charts to graph the data over time and assess whether or not the process was stable, in preparation for conducting capability analysis. 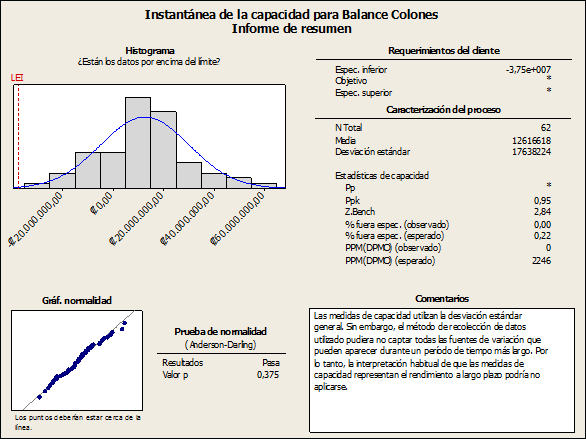 To choose the right control chart and create comprehensive summaries of the results, the team used the Minitab Assistant. The team then performed a capability analysis of each group’s current cash flow to determine whether customer transactions matched the services provided, and establish the percentage of cash used at each branch. The analysis revealed that, in total, the vaults contained more than the necessary funds each branch needed to operate effectively, but excessive circulation of the money caused some to overdraw their vaults while others stored cash that was not utilized. The analysis gave the team the confidence to move forward with the Improve phase: implementing real-time control charts that enabled management to check each branch’s cash balance throughout the day. Managers could now quickly move cash from branches with excess cash to those needing additional funds, and make more strategic cash flow decisions. The changes made during the project increased cash usage by 40% and slashed remittance costs by 60%.The new process also cut insurance costs and shrank risks associated with storing and transporting cash. Overall, the project increased revenue by $1.1 million. To read a more detailed account of this project, click here.